For your convenience, The Extra Smile now offers online bill payment. Please click the button below to go to our secure portal. Dr. Hoftiezer is thorough in his work and is very detail oriented. He does excellent and excellent job at making sure you are comfortable and stands by his work. I've been seeing him for about 9 years now and have only good things to say! Who can say that a root canel was pleasant, well dr tim and staff did everything possible to make mine no big deal. Thank you everyone. Dr. Hoftiezer is a great dentist. He is very personable and knowledgeable in the field of dentistry. He has taken great care of my teeth and spends a considerable amount of time explaining what I need to do to prevent further decay or damage. The technicians and office staff are also kind and helpful. Would highly recommend to anyone. 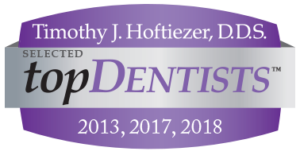 Dr. Hoftiezer and his staff are personable and do excellent work. What more could you want? Dr. H is the best! What is also important to me is his staff. Time is valuable so having great service is essential from the moment I walk in. Thanks to the entire Extra Smile team. Dr. H and his entire staff are always courteous, professional, and caring. They are "Great". I have referred friends in the past will continue to do so.